Description: The title, imprint and compass rose of this plan appear at top right with scale bars at the foot of the plate. 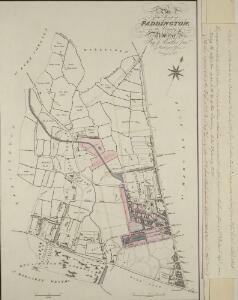 It is accompanied by handwritten note with key to land acquired by the Grand Junction Canal Company from the Bishop of London(depicted in red) with the proposed new roads into the Bishop's estate.These roads are represented by a brown double-dotted line and were added by the surveyor Ralph Samuel Cockrell. With Cockrell's additions, this plan was presented to the Commissioners of Sewers for consultation on the best way to lay out a sewage and draining system in the area.